I knew September was the Month of Omnipresent Spiders. But imagine my surprise and delight when I walked outside this morning and discovered the Doug fir in our front yard (our 2001 Yule tree) bedecked and bedazzled with webs. And the hedgerow too. Ah . 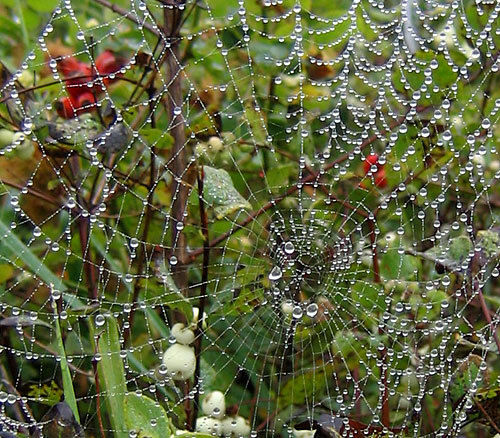 . . such simple, soulful gifts of a foggy September morn. 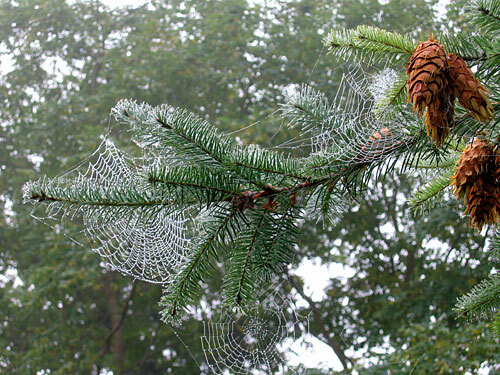 Joanna, as a lover of September and webs from “away back there somewhere”, I just have to say it – these photos of webs (and the cones and the tree) are magnificent. Simple soulful gifts indeed and poignant too. Bravo!! !